Author(s): Teena Saini, Faculty of Pharmaceutical Sciences, Maharshi Dayanand University, Rohtak-124001, India. Sanjiv Kumar, Balasubramanian Narasimhan. 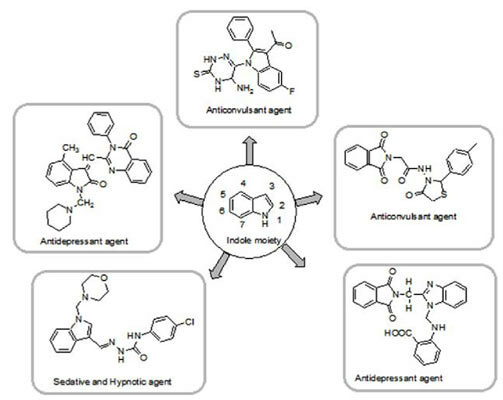 Indole and its derivatives are continuously drawing interest of researchers in the field of medicinal chemistry for development of newer significant moieties due to their wide range of biological activities. In recent years, indole nucleus has been used to a greater extent for the development of agents acting on central nervous system (CNS) disorders like epilepsy. Binedaline, Amedalin, Pindolol, Siramesine and Oxypertine are the marketed drugs used in CNS disorders having indole moiety. So, keeping this point in mind, the review is specially focused on pharmacological activities of indole derivatives acting on central nervous system like anticonvulsant, antidepressant and sedative-hypnotic activities. The present study covers updated information on the most potent indole derivatives during the past years and also its recent developments. These results may help the researchers to develop novel ideas for future molecular modifications of indole derivatives with potent pharmacological activities and least side effects may be derived. Keywords: Anticonvulsant, antidepressant, central nervous system, epilepsy, indole derivatives, sedative-hypnotic. Affiliation:Faculty of Pharmaceutical Sciences, Maharshi Dayanand University, Rohtak-124001, India. Keywords:Anticonvulsant, antidepressant, central nervous system, epilepsy, indole derivatives, sedative-hypnotic. Abstract:Indole and its derivatives are continuously drawing interest of researchers in the field of medicinal chemistry for development of newer significant moieties due to their wide range of biological activities. In recent years, indole nucleus has been used to a greater extent for the development of agents acting on central nervous system (CNS) disorders like epilepsy. Binedaline, Amedalin, Pindolol, Siramesine and Oxypertine are the marketed drugs used in CNS disorders having indole moiety. So, keeping this point in mind, the review is specially focused on pharmacological activities of indole derivatives acting on central nervous system like anticonvulsant, antidepressant and sedative-hypnotic activities. The present study covers updated information on the most potent indole derivatives during the past years and also its recent developments. These results may help the researchers to develop novel ideas for future molecular modifications of indole derivatives with potent pharmacological activities and least side effects may be derived. The α2δ Subunit and Absence Epilepsy: Beyond Calcium Channels?